Browse all our free flower patterns. I am sure you will find one perfect for your project. Note: For hdc dec, (yo, draw up 1p in st indicated] twice; yo and draw through all 5 1ps on hook. Join yarn in next unused sc of Rnd 1 from first petal. Rnds 1-5: Rep rnds 1-5 of First Petal. Third through Fifth Petal Work same as Second Petal. Cut 20-inch length of yarn and knot one end.Thread a sc, turn. (3 hdc) small bead on yarn and make knot at top of bead. Rep with rem 8 small beads.Trim ends. 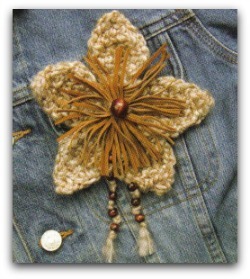 Step 1: Referring to photo for placement, sew center of beaded trim between any two petals. Step 2: For flower center, roll leather fringe piece tightly and insert into center of flower. With sewing needle and thread, tack to back of flower. Step 3: Cut 10-inch length of yarn.Thread rem large bead on yarn and sew to center of flower.